Literary masterpieces, fashion-forward designs and awe-inspiring paintings. Scotland has been at the forefront of the world’s creative scene since, well, forever. This year, we’re shouting about our achievements from the rooftops throughout the Year of Innovation, Architecture & Design 2016. Scotland has a very rich creative offering, with diligent craftspeople and gifted artists to be found across all regions. Browse below for a few places where imagination knows no bounds. Wind your way through the rolling countryside of the south west, and you’ll come across a little book lover’s haven. Wigtown is a world of words, with centuries of knowledge and creativity spilling from the pages of the town’s extraordinary book collection. With over a quarter of a million books to bury your nose in, you’ll come away with many gripping reads, and perhaps a few treasures you didn’t expect to find. The largest second-hand bookshop in Scotland can be found here – it’s very aptly-named The Bookshop. Wigtown has been Scotland’s National Book Town since 1998. It’s a traditional market town, with old buildings and heritage lurking around every bend. There are lots of places in and around the town to get lost in a good book; it’s right on the cusp of Wigtown Bay, or you can head out to the Machars Peninsula. The town hosts several literary events, including the upcoming Spring Book Weekend from 29 April – 1 May. Every autumn, the Wigtown Book Festival – this year from 23 September – 2 October – attracts famous authors from far and wide to talk about their latest works, as well as storytelling sessions, book signings and much more. ‘In Kirkcudbright, one either fishes or paints’ – Dorothy L. Sayers, writer and novelist. For many years, the town of Kirkcudbright was home to a vibrant artists’ colony, with notable artists such as E.A Hornel, E.A Taylor, Jessie M. King, Charles Oppenheimer and many others forming a movement known as the ‘Kirkcudbright School’, which took its influences from the Glasgow School of Art and the Scottish Colourists. With its gentle, rolling coastal landscapes and serene atmosphere, Kirkcudbright has inspired generations of painters, many of whom visited the region for their summer holidays. Today, Kirkcudbright is still a hive of creativity, with many local artists exhibiting their work in the town’s several galleries. There’s nowhere better than Kirkcudbright for a picturesque pick-me-up. Stop for lunch or a coffee in one of the cafés before dropping by the art galleries and walking along the harbour. Many exhibitions come to town every year, including a special summer exhibition at the Town Hall. While you’re in the area, explore the beautiful south-west coastlines with beaches at Brighouse Bay, Sandgreen and Mossyard, or drive along to the nearby chocolate factory, the Cocoa Bean Company, just a few miles away in Twynholm. The region has recently been crowned Holiday Destination of the Year by BBC Countryfile Magazine Awards 2015/16. West Kilbride is Scotland’s first ever Craft Town, nestled on the North Ayrshire coast and overlooking the Isle of Arran. A truly creative wee place, you’ll be able to see some incredibly talented craftspeople in action, as well as enjoy some inspirational exhibitions and events throughout the year. Wander through a wonderful world of crafts! The town features the Barony Centre, a stunningly converted old church, and eight individual working craft studios each showcasing their diverse talents. The studios are predominantly workshops, where the highly-skilled craftmakers hone their designs, collect the raw materials and produce their carefully crafted creations. Are you stumped for something to buy that friend that has everything? The studios often have items for sale, including basketry and weaving, intricate glass work, bespoke jewellery and gorgeous handmade textiles. From West Kilbride, you can explore the beautiful Ayrshire coastline, dotted with beaches, golf courses and heritage. Opening 10 July, this major land restoration project is one of Scotland’s newest innovations! An open-cast coal mine on the Queensberry Estate has been transformed into an almighty art land, inspired by the grounds’ own ecology and materials. The design takes its influence from elements of space and cosmology, making it a truly mesmerising outdoor space to explore. 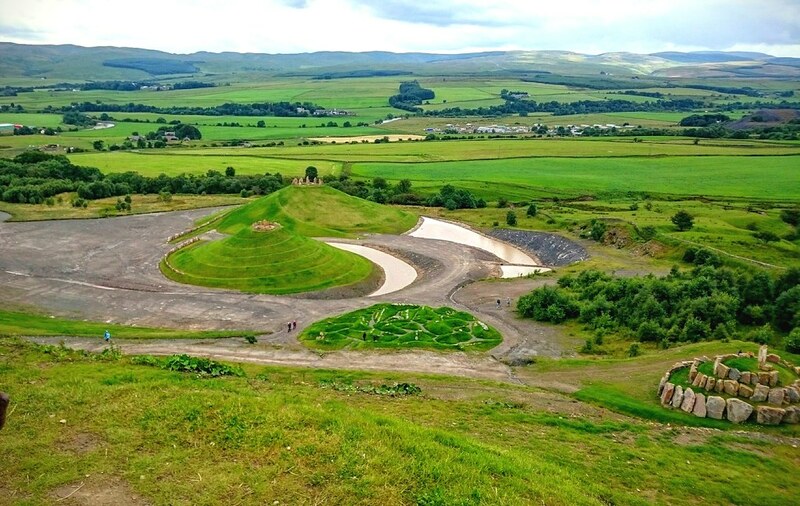 Don’t miss a weekend of celebration from 24 – 26 June, as the Crawick Multiverse hosts a series of events to mark the Summer Solstice. Visit the cultural hub of Clackmannanshire which consists of the Makers Village, the Makers Village Annexe and Marcelle House. With galleries, exhibition spaces and a bistro, this corner of Alloa is home to over 30 diverse creative businesses. This is the most north westerly community in the UK and was once simply a disused military space. Now it’s a bustling artsy hub in the Highlands. The spectacular location, beside the dunes of Balnakeil Beach and the clifftops of the Faraid Head peninsula, provides an idyllic backdrop for all sorts of crafty ideas, galleries and art shops. Are you feeling inspired by the Year of Innovation, Architecture & Design? Visit our website for more information about Scotland’s most famous inventions, creations and much more. Have you been somewhere crafty and creative in Scotland recently? Share your pictures with us using the hashtag #ScotSpirit.